I wrote earlier about the highlights of our weekend, but I neglected to mention having our friends over for Sunday brunch. Yeah, we're fancy like that. These are the same friends we go camping with every August, but during the rest of the year we're so busy we hardly talk to each other. We call them our "summer friends." Kind of like how some people have summer homes. Again, because we're fancy like that. Anyway, even though it was a very busy weekend already we decided to try to make brunch on Sunday morning work. But I forgot that there is no way we're competent enough to be awake, dressed, ready, and have a presentable meal on the table by 9:30. So the morning started with a lot of banging pots around on the stove and general muttering on my part, but it turned out just fine. 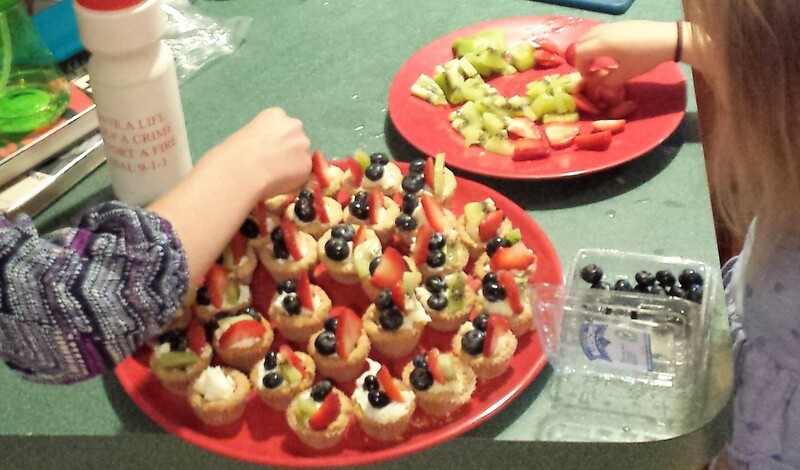 I mean, we had little fruit tarts for dessert so it couldn't be that bad, right? One reason our weekend was so busy was General Conference, a Mormon broadcast from our church leaders. Speakers are assigned topics but there's usually a feeling of order and cohesiveness throughout the talks, anyway. The text and video transcripts of all the talks are here, or you can see video of my favorites in this post. I highly recommend watching them with a toddler climbing on your head screeching like a fisher cat. I mean, I've never really watched them any other way, but it's worked for me so far. 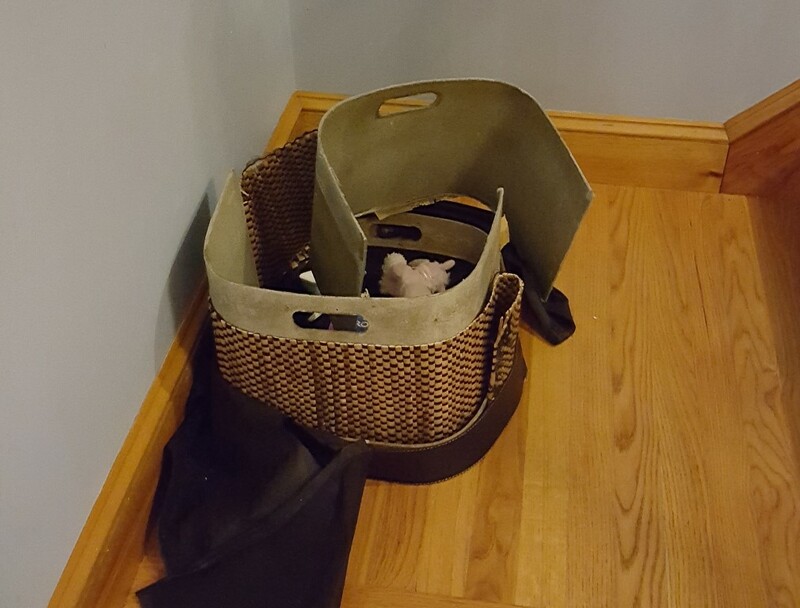 Keeping a basket at the foot of the stairs has been life-changing for us. 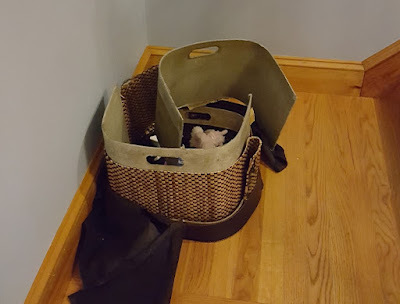 When junk from the kids' rooms migrates downstairs throughout the day, I throw it into the basket and they will theoretically take care of it later. But after almost 5 years, our once-serviceable basket was looking pretty sad. Technically we can't even call this a basket anymore, since it's just a pile of rubble. 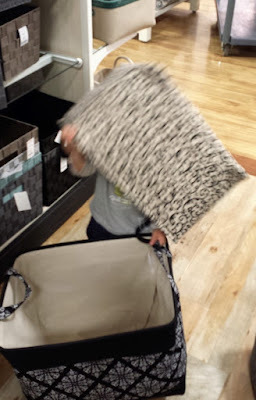 The 2-year-old enjoyed helping me shop for a new one. Much like when I go bathing suit shopping, he tried on every one in the store and finally settled for the first one he put on. My housekeeping style over the last few days, according to Phillip, can best be described as "on the rampage." Is there such a thing as Bipolar Cleaning Disorder (BCD)? Because I think I may have it. I will walk straight past the jelly handprints on the dining room wall 10 times a day for a week, but when I finally decide to wipe it up a strange compulsion to scrub the entire room from top to bottom overtakes me. Resistance is futile. So I do, but the problem is that I must be living in a house full of magicians or wizards because as soon as I blink, the room looks exactly as messy and dirty as it did before I spent 3 hours on it. I need to get a stack of those little cards that hotel maids leave behind to let you know that the room was serviced while you were out, except mine will say, "I just cleaned this house. DON'T TOUCH IT." We're looking forward to a visit from some relatives we haven't seen for a long time, long enough that my 4-year-old doesn't remember who they are. She was asking me all kinds of questions to jog her memory: What do they look like? Do they have glasses? What color is their hair? "Well, your great-uncle has gray hair," I said. "Is he really old? Is he this small?" she said, crouching down on the floor to demonstrate a really shrunken old person who is only a foot and a half tall. My 7th grader's school just had Eat Lunch with Your Child Day. I asked my daughter if she wanted me to come and her answer was a noncommittal shrug and an "If you want to." And then I mentioned I could bring the baby and she was suddenly thrilled with the idea of showing him off to her friends having her dear mother joining her for lunch. He wasn't sure what he thought of being passed around a noisy middle school cafeteria but he was the star of the 23-minute lunch period. Not sure why there is a bike helmet in here. All I can say is that my kids must take safety very seriously. 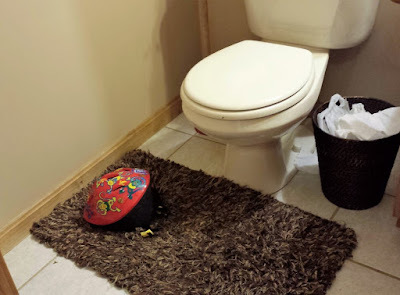 **Update: Since everyone requested it, I've written a post about strange things I've found in the bathroom. Yep. An entire post. I am the same way with cleaning! I'll totally let things go and be fine with it, but once I get in the cleaning zone, I have to clean everything and I turn into an utter maniac. I really like your idea of having a basket near the stairs! And can I just say, I am in utter admiration of those tarts and the fact that you had people over for Sunday brunch? I am seriously impressed. This is exactly the cycle of BCD! BCD is real, because I have it too! In fact, I'm in the throes right now. I've been cleaning all day! Jenny, you are one brave, or else insane woman!! A brunch before church?? WOW!! The thing that keeps me out of the throes of BCD is reminding myself that if I take 3 hours to clean that kitchen top to bottom, I'm going to walk out of the kitchen to find the entire rest of the house destroyed. Then I just nag one of the kids to do it! I love the basket at the foot of the stairs idea. It definitely saves time, but it amazes me that such a small basket works. Everyone must be doing a fairly decent job of keeping things where they really belong. Rage cleaning should have its own APA diagnosis, if you ask me. Considering that the other basket broke because it was routinely filled to overflowing with the kids' stuff, I can't comment on the job we're doing. What can I say? The kid loves her mom. I wish logic worked on my BCD!